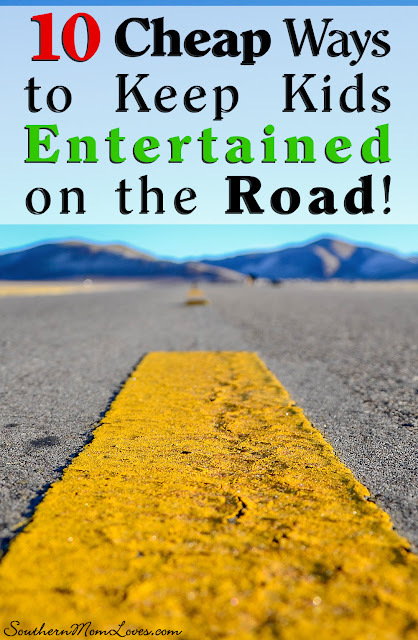 Southern Mom Loves: 10 Cheap Ways to Keep Kids Entertained on the Road! 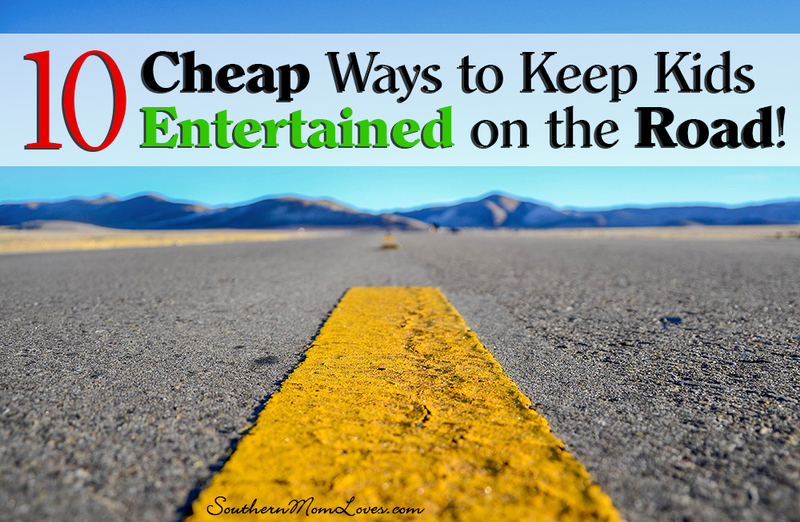 10 Cheap Ways to Keep Kids Entertained on the Road! Is your family taking a road trip this summer? If so, are you dreading the typical “Mom, I’m bored!” chorus from the back seat? Taking a road trip with kids can be a stressful event for any parent, but there are a few things you can do to help keep your kids entertained and peaceful and guess what? You don’t need to bust your budget to do it! These 10 cheap ways to keep your kids entertained on the road are great for road trips or anytime you’re in the car together! 1. Custom art kits – Put together a custom arts and crafts kit for each of your kids. Swing by your local Dollar Tree and pick up a basket for each of your kids. Pack them with coloring books, crayons, colored pencils and other art tools. By giving each of your children one, you’ll cut down on any fighting between them and have a way to keep them occupied when they’re bored. All for less than $15.00 total. 2. Portable DVD players – Portable DVD players were once expensive, but these days you can find them for as little as $50.00 without really searching for a deal on one. Pick up one for your backseat and a pair of earbuds or headphones for each of your kids and let them spend the ride watching their favorite movies. 3. A joke book gift set – All kids love a good joke and they’re great for keeping them busy in the car. Grab a few kids joke books and let them laugh themselves into not noticing the passing miles. 4. A set of their favorite books – Pack your kids favorite books in a tote and let them read themselves to dreams of their favorite characters. 5. Kids' atlas – If you’re headed on a long road trip, don’t forget to pick up a kids' atlas for your kids. Draw your travel route for them and let them follow along on the drive. 6. Road trip games – Everyone remembers playing games in the car as kids and your kids will enjoy those same games! Play a game of road trip I Spy, play the license plate game (try to find a license plate from every state) and so on. 7. Karaoke – Connect your phone to your car speakers and pull up Spotify or your favorite streaming service. Most of them have kid-friendly karaoke tracks. Turn the speakers up and let the kids belt out their favorite songs! Sing along with them to make it extra fun! 8. Card Games – Believe it or not, you can play cards in the car. If you have bucket style seats, set a small cooler between them. Your kids can use the cooler as a table to play cards or checkers with. You can also get a kid's cushioned lap tray to play on. 9. Disposable Camera – Want to make a really awesome scrapbook of your trip? Let your kids use their phones (if they have them) or give them a disposable camera and let them photograph things until their hearts are content. You might just get surprised and find that you have a budding photographer in your midst! 10. Kindle for Kids – If you or your kids already have a Kindle, make sure that you have Amazon’s FreeTime Unlimited turned on for them. They’ll be able to read kid friendly books, download only kid-friendly apps (with permission of course) and watch kid-friendly shows. You’ll need to make sure that you download the items they want on Wi-Fi for the road unless you don’t mind them connecting to your phone's data or a Wi-Fi hotspot to do so. I hope these tips come in handy on your next road trip! Are you planning a road trip? What are your favorite ways to keep the kids occupied? I love to read your comments!